They have been ripe for a month. I have bags of frozen tomatoes. I've eaten salads and wrap sandwiches. I made tomato soup. I've roasted tomatoes. The variety is endless. I have lots of new recipes that I like. One of my favorites is chicken tomato pizza. I use preformed pizza dough, cherry tomatoes, olive oil, cooked chicken (a staple in my house), basil, mozzarella cheese and Parmesan cheese. Stick in the oven until brown. So far, all the extra tomatoes have gone in the freezer. I still might can some, but right now, I can't put my hands on my jar lifter. I really need it if I'm going to get jars our of boiling water. I can buy a new one for not much money, but I still have one more place to look. Also, if I don't actually get to canning, I won't need it. A new discovery that one of my daughters found. It's made in a jar and eaten cold. So far I have tried blueberry, peach and apple. I may have tried more flavors, but they're not at the top of my mind. One daughter thinks the chocolate ones might make a good snack. Another daughter has made up large batches of pumpkin flavored jars. In looking for the link, I found a number of other recipes on Google. The one I've used combines the oats with yogurt, some of the others just use milk. These were a birthday gift for oldest daughter. I thought of them as butterflies, but she's a quilter and saw them as bow ties. The technique is Mosaic, using only one color per row, and slipping the other color. Daughter number three has a birthday the day after her sister. She got these socks. The dishcloth shows the stitch pattern. We also have a granddaughter with a September birthday.. She was in town last weekend to celebrate and show off her son, who is 4 months old. She got the last pair of socks. 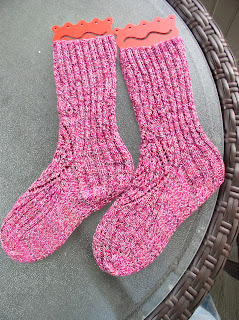 I followed a Ravelry mystery pattern for these. I also am knitting Christmas stockings. 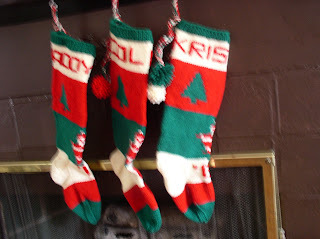 I have 5 identical stockings, except for name, to do for a commission job. Three are finished and I'm working on #4. As it's getting colder, I set myself the task of knitting on them at least one hour a day. I also have two family stockings to do, one for the new great grandson and one for a granddaughter's husband. Should have done that one last year. Every year or so, I knit stockings for other people. It's the same story. 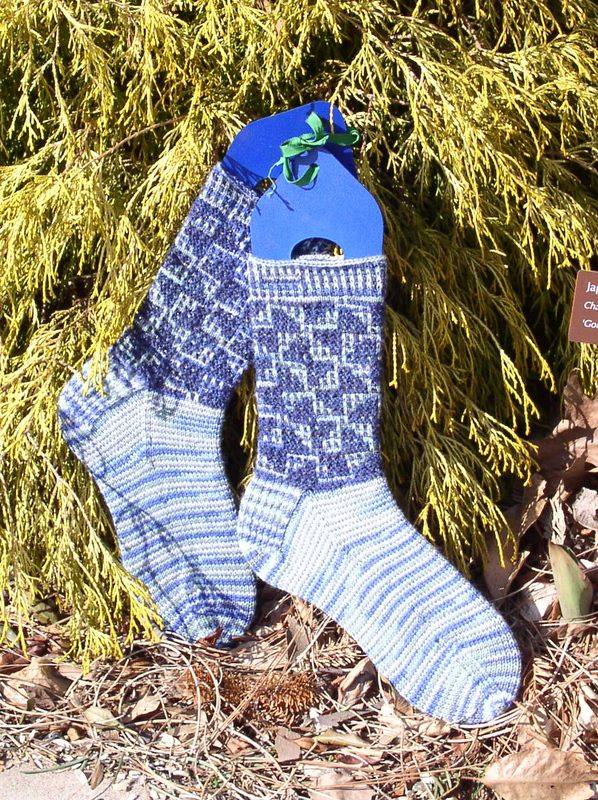 Grandma knit stockings until she couldn't any more and the family kept growing. I've knit a version of this pattern before. 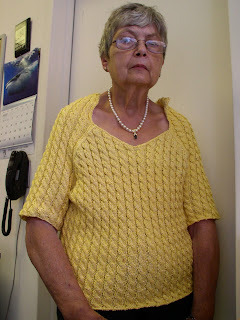 Most of what I've knit are old Bernat patterns. A few I've had to design myself. The family patterns are all original. I'll talk more about them when I get to that point. This sweater looks almost like I wanted it to, but it doesn't work! There is no stability in the neckline, and it slid down as I wore it. Luckily it was just a dog walk of about 20 minutes. I'm now on try #3 of the neckline. I've kept the v-neck, but gone with a more conventional look. I'll wear it for a while before I call it done. I may have to crochet around the neck edge to keep it from stretching. 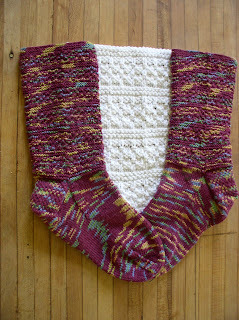 I still love the yarn and stitch pattern, but I sure am ready for this to be really finished. I finally figured out the time delay on my camera. It's a good thing that I'm not using up film on pictures the crop off part of my body. Hi Lorraine! 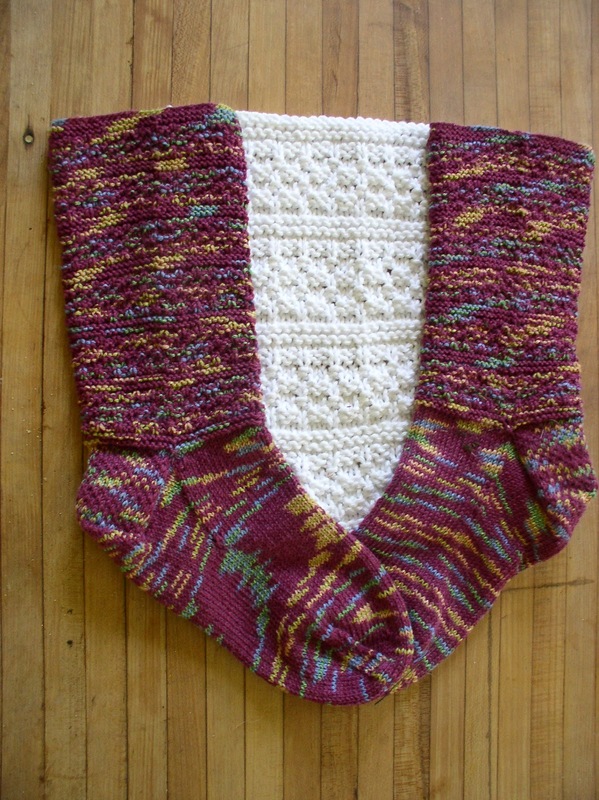 Do you have a copy of this pattern? I was asked to take over the tradition by a friends who's grandmother passed away. I'm having trouble finding the pattern. I have a couple of versions of this pattern. The first time, I scanned the stocking in my scanner. It was easy to count the stitches. Give me more information about the version you need. Hi Lorraine. 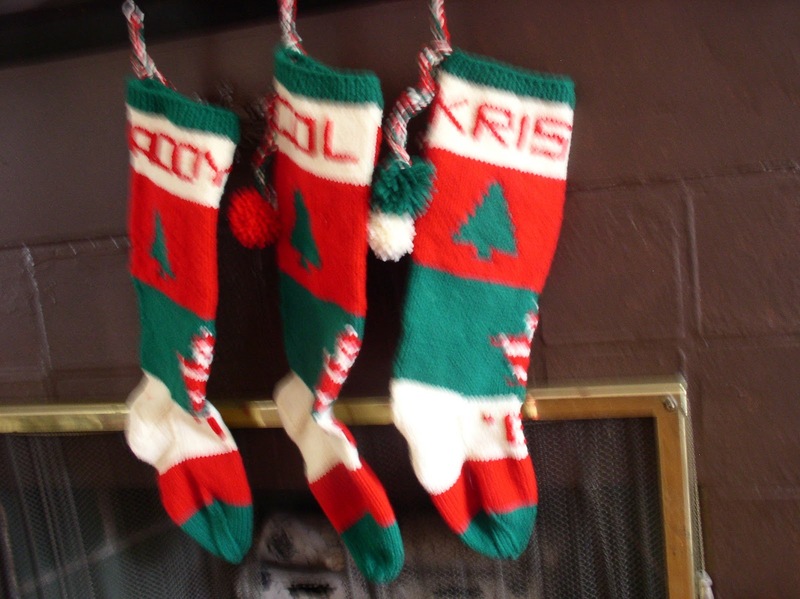 I'm wondering whether you still have a copy of this stocking pattern, the one with the personalized names on top and the year on bottom? It's also a tradition in our family but I'm having trouble tracking down the pattern in my grandmother's old things. New baby on the way, so I'm hoping I can find it before then! Thank you!